Colder than a landlord’s heart, a well-digger’s rear-end, or Jack Nicholson at the end of “The Shining,” Wisconsin’s Door County is colder than many places. But facing frigidity is only part of the equation in Door County; the other part of the deal is getting cozy. And that’s the cycle: freeze down, cozy up, repeat. You want cold? How about a ride on an ice breaker through the Death’s Door passage? Sounds cold, right? Oh, believe us: it is. 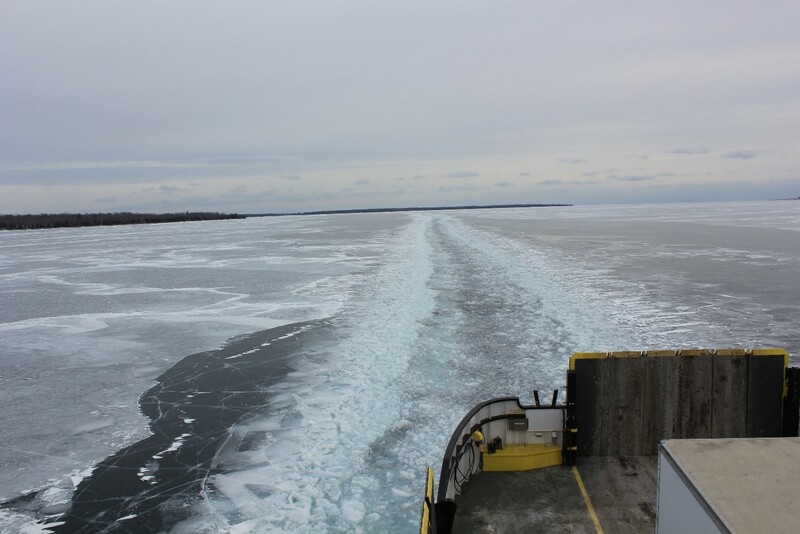 We took the Washington Island Ferry, and it was kind of awe-inspiring to be that frozen, riding through frozen water, in a frozen boat. It’s an extreme experience, similar to the “constrained risk” of eating red hot chili peppers or riding a roller coaster: you feel close to death, but then you don’t die, so you feel good. 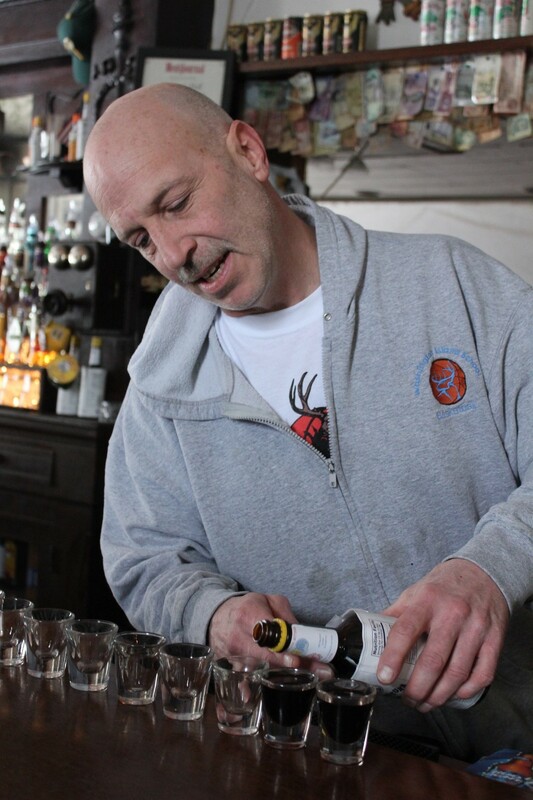 On Washington Island, Nelsen’s Hall has been around since the nineteenth century, earning fame by serving shots of Angostura bitters; if you have one too many of these shots (and one may well be too many), get a room next door at the Bitter End Motel. 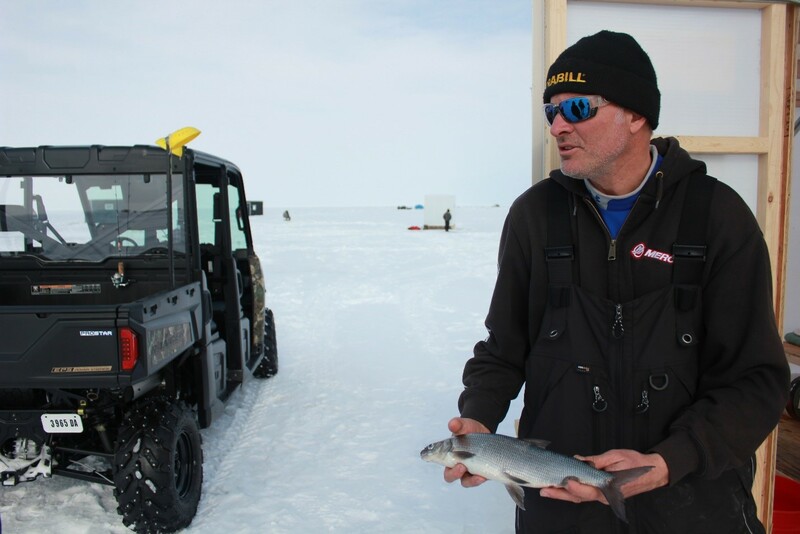 Ice fishing transforms a casual sport into a death match with Mother Nature, pitting the frail human body against endless stretches of frozen whiteness. With the wild boys at Wacky Walleye, we actually found ice fishing to be very enjoyable. Dale Stroschein, 2014 Fresh Water Fishing Hall of Fame Inductee, set us up in a heated shanty, which was quite cozy. Still, it all felt undeniably precarious, sitting on an ice sheet five miles from shore in Green Bay, wondering if we might hit one of several “thermal pockets” where the ice cracks, plunging us into a frozen death or maybe suspended animation until spring thaw. I’m glad we went ice fishing. I feel no compelling reason to do it again. But all the bitter coldness of Door County is prelude to the warm coziness of finally getting indoors. Door County’s climate and terrain appeals to Nordics. At Al Johnson’s uber-cozy Swedish Restaurant, maidens serve in traditional Swedish garb in a dining room with throwback Colonial-type furniture. This place’s signature gimmick is a roof of sod for grazing goats (it was too cold for goats when we were there). 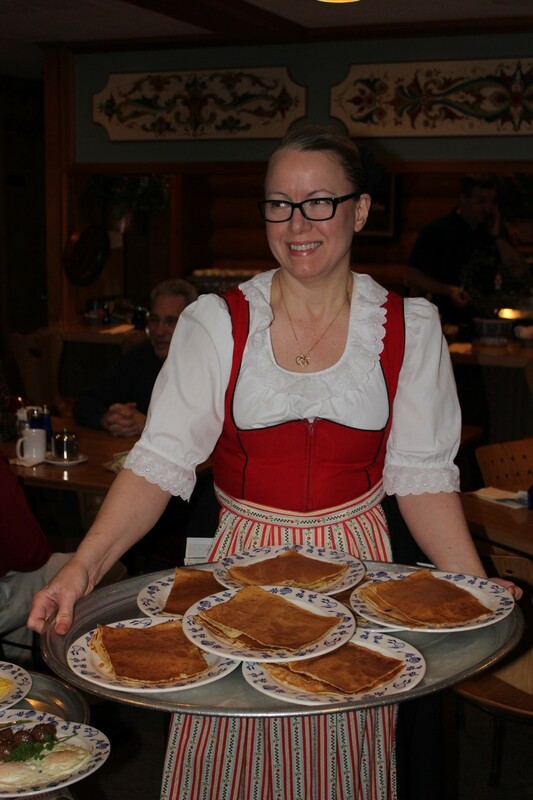 On the tables are Swedish specialties like pytt i panna, a roast beef hash, and de rigueur Swedish pancakes and meatballs. Johnson’s pickled herring was superb and take-home containers of this superb pickled fish are available in the “butik” ($10/quart). Wisconsin is all about the supper club, and Sister Bay Bowl goes one better: it’s a supper club AND bowling alley. Dinners come in Full and Adult Lite portions, the latter especially appealing to those of us who aren’t lumberjacks. There are retro-platters here, like the liver/bacon/onion Thursday night special, but the clear winner is broasted chicken: the bird fried in a pressure cooker, resulting in very light fry all around, very moist meat, wonderfully simple, with no discernible seasoning. To drink, it’s got to be the standard supper club sip: Brandy Old Fashioned. Since the 1890s, fresh fish boiled with red potatoes and onions was traditionally a way to feed large groups of people and raise money for churches and other civic projects. The climax of the boil is when kerosene is thrown on the fire, creating a dramatic flare-up and ensuring boil-over, which pushes out all the fats that have risen to the surface. You really have no choice about the fish boil: you must attend one—it’s pretty much required. The fish boil serves up high-carb spuds and bread and protein enriched with creamy tartar and butter sauce, all very non-aggressively spiced…and hugely comforting. We Chicagoans may find the food a tad under-seasoned, in line with traditional Nordic cooking. We will say this: when you forgo multiple ingredients and sauces, the purity of the flavors are foregrounded. 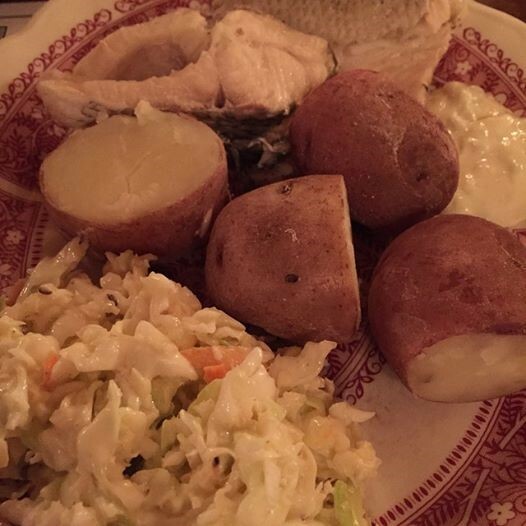 It’s unlikely you’ll find fresher, better whitefish than what’s served in Door County at places like the White Gull Inn. Shipwrecked Microbrewery, Pub & Inn pours only Door County brews, some of which are available only in Wisconsin. Many of these beers are very good: we went home with six-packs of Bayside Blonde and Cherry Wheat beers, both of which had a lot of depth and character. Cherries are big in Door Country: the climate is right for them, and resident Nordics dig berries of all sorts, particularly lingonberries, which are shipped in from Sweden. At this time of year, a warm cherry or lingonberry pie is particularly cozy, and such pastries are everywhere on the peninsula. Sugar, in fact, may be the condiment of choice in Door County. Of course, the coziness quotient is raised significantly when you bring your S.O., but we probably don’t need to tell you that. Few people go to Door County solo, and there are a lot of reasons for bringing a friend to up the coziness quotient. Full disclosure: this press tour was organized and partly subsidized by the Door County Visitor Bureau and associated hospitality organizations.